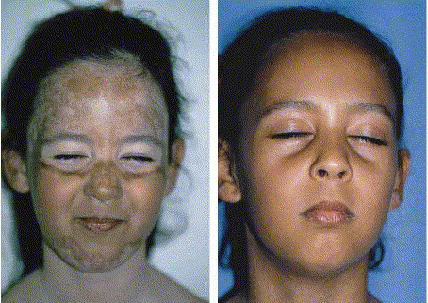 There are many treatment options available for the repigmentation of vitiligo. These are: topical corticosteroids, topical PUVA, oral PUVA, and narrowband UVB. There are many corticosteroid creams as well as ointments available for the treatment of vitiligo. The creams might work well or might not work well, depending on the location of the white patches which are caused by vitiligo, and depending on the patient’s body condition. Corticosteroids which are of low strength should be used on children, and corticosteroid creams of higher strength should be used only by adults. Additionally, when corticosteroid creams like Temovate are prescribed, they should only be used on specific areas and not on all areas. Frequent use of these topical corticosteroids should be avoided because it will lead to thinning of the skin. If any irritation occurs due to the use of topical corticosteroids, then its use must be stopped and a doctor should be consulted immediately. The application of the topical corticosteroids on the affected areas will help in repigmenting the skin, thus treating this undesirable symptom of vitiligo. This involves the application of an ointment which contains 8-methoxypsoralen (8-MOP) to the white patches. This treatment should be administered only by the nurse or the doctor, and not the patient. It must be applied 30 minutes before the exposure of skin to ultraviolet A. This topical PUVA treatment is carried out on children and adults who are having the white patches only on limited areas. The treatment period for topical PUVA will vary from 6 to 18 months, and constant checking of repigmentation must be conducted. After the treatment involving exposure to the ultraviolet light, the area is washed with soap and water, after which a sunscreen lotion will be applied. After the procedure, the treated skin should not be exposed to sunlight for the next 24 hours. This is essential for repigmentation of the skin. The patient must keep in mind that the white patches should always be protected with sunscreen lotion. For this method, the patient will be asked to take a drug known as psoralen by mouth, approximately 2 hours prior to his exposure to ultraviolet light. The doctor then adjusts the UV light dose until the areas under treatment turn to pink. This type of treatment should be done twice a week, and the treatment might vary from 6 to 18 months. This is because patches which are small will repigment in a short period while larger patches will take a longer time for repigmentation to occur. This method is not recommended for children under the age of 10 as there is a high risk that the eyes may be damaged. Note that this treatment will not favorably affect areas like the lips, fingers, and toes, so people having white patches in these areas should avoid using this treatment. On the other hand, this method may have favorable results on patients whose patches appear on the neck and facial areas. After the treatment, the skin will start to repigment, ridding the skin of the unsightly white patches.